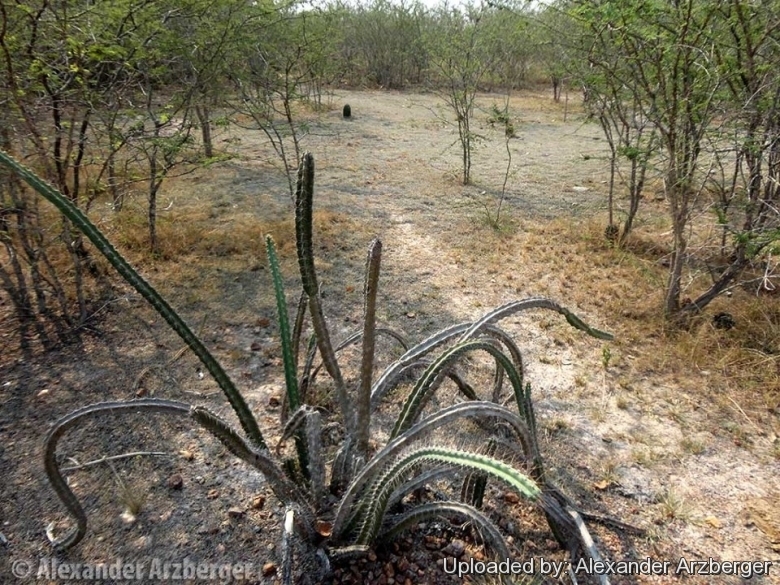 Habitat of Cereus kroehnleinii, Mato Grosso do Sul, Brasil. The climate is tropical and there is no frost in the winter (the habitat is just north of the Tropic of Capricorn), but the nights are cool and this helps a lot. The night dew makes the difference. 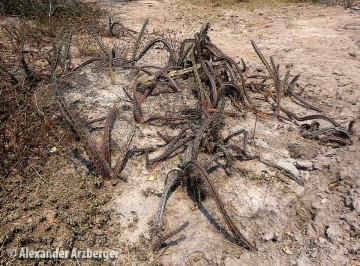 Origin and Habitat: Cereus kroenleinii is found in Santa Cruz (Bolivia), in Mato Grosso and Mato Grosso do Sul (Brazil) and in Paraguay. Altitude range: This species occurs at elevations between 10 and 500 metres above sea level. 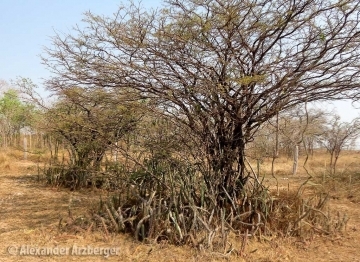 Habitat and ecology: This cactus grows together with Cereus bicolor in dry forests creeping among other vegetation in the Pantanal of Mato Grosso, mostly at the edges of the hummocks (floodplain) between the vegetation of the wooded islands that stands just above the high water level of the rainy season. The plants, that are characterized by pendent growth, occasionally hang down from the tops of granite outcrops, termite hills or cliffs (for instance, along the bank of the Rio Paraguay). Cereus kroenleinii is widely distributed, locally common, and there are no major threats affecting it, but in the easternmost portion of its range it may be affected by deforestation for agricultural purposes. 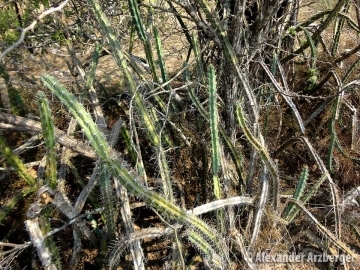 Description: Cereus kroenleinii is a shrubby cactus with thin and flexible branches, standing erect among the other vegetation, otherwise creeping and forming tangled clumps to 2 m tall and 6 metres in spread. Some authors now call this plant Cereus kroenleinii, but Braun and Esteves believe it should be understood as a subspecies of Cereus phatnospermus. Derivation of specific name: This member of the Cactaceae family was given this name in honor of Marcel Kroenlein (1928-1994), director of the Exotic Garden of Monaco from 1969 to 1993. Stems: Long cylindrical, erect or creeping, 1-4 m long, to 2.5 cm in diameter, dark green, very glaucous, square in cross section when young, nearly round in cross section when mature. Ribs: 4-5, forming distinct tubercles. Areoles: Round, confluent apically, otherwise separated, with long woolly hairs. Spines: Needle-like, very thin, sharp, dark brown with yellow bases. Central spine: One, 2-3 cm long. Radial spines: 5, to 1.5 cm long, , the lowest spine being the shortest. Flowers: Night blooming. Funnel-shaped 9-10 cm long. Perianth segments white with pink tips. Taxonomy: The first description made by Roberto Kiesling as the Monvillea kroenleinii is considered invalid because the specimen reviewed and cited in the description was not formally designated as such. Thus the combination Cereus kroenleinii (R. Kiesling) PJ Braun & E. Esteves (Succulenta 74 (2): 83-84 (1995) as "kroehnleinii") was also invalid and Nigel Taylor validates the name by publishing a new description. However, it is noteworthy that Detlev Metzing expressed a dissenting opinion in Cactaceae concensus initiatives 3:14 (1997) remarking that if the holotype was not formally designated as such, and Roberto Kiesling did not see the preserved specimen at Munich (M), its photos can not constitute the type, so there is no doubt that he intended to designate as holotype specimen the other specimen cited in its description, that is to say the specimen collected by J. Fernández Casas and J. Molero-Broines under the number 4468 and held in Geneva. 2) Oakley, L. & Pin, A. 2013. Cereus kroenleinii. The IUCN Red List of Threatened Species 2013: e.T152028A588861. http://dx.doi.org/10.2305/IUCN.UK.2013-1.RLTS.T152028A588861.en. Downloaded on 25 June 2016. 3) Hunt, D., Taylor, N. and Charles, G. (compilers and editors). “The New Cactus Lexicon”. dh Books, Milborne Port, UK. 2006. 4) Arenas, P. “Etnobotánica: lengua-maskoy” Fundación para la Educación, la Ciencia y la Cultura, Buenos Aires. 1981. 5) Arenas, P. “Nombres y usos de las plantas por los indígenas maká del Chaco boreal”. Parodiana 2 : 131-229. 1983. Cultivation and Propagation: Cereus kroenleinii is very easy to cultivate, easy to propagate, and produces numerous showy white flowers 10 cm long. Growth rate: It grows quickly (a young plant will easily grow more than a 30 cm per year). Soils: For pot culture it needs standard cactus soil. Outdoors needs well drained spots, with deep soil, but will still thrive in less than ideal conditions. Hardiness: Reputedly sensitive to frost, but less so if kept on the dry side prior to, and during, cold weather (hardy to -5° C for short periods). However some warmth throughout the year will increase the grower's success (minimum 5° to 10°C during rest season). In presence of high atmospheric humidity make sure that your Cereus kroenleinii are not exposed to freezing temperatures, or they may die. Outdoors this plant is very adaptable, as long as you avoid excessive humidity in the winter months. Exposition: It likes filtered sun, but is tolerant and do well with light shade during the hot Summer months, inside it needs bright light, and some direct sun. Tradition uses: Mature fruits of this species are consumed by the natives Ayoreo, Lengua-Maskoy, and Maka.